The Allen College Alumni Association invites you for a great evening including social hour, heavy hors d’oeuvres, silent auction, raffle, and live entertainment by the University of Northern Iowa a cappella group The SingPins. Tickets to attend are just $50 per person. Donate to Educate is offering many great raffle items that can be purchased prior to the event. Winners need not be present. Purchase a $25 chance to win a one-week stay in Sarasota, FL located on Siesta Beach! This condo accommodates 6 guests and must be used in 2019. We have $5 raffle tickets to win a chance at a Seiko men’s watch, half hog, outdoor firepit, or front row parking space at Allen College. Contact Beth Sullivan at 319-226-2016 or beth.sullivan@unitypoint.org with questions about attending Donate to Educate. 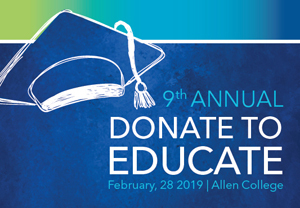 Support Allen College and help to continue their 90-year tradition of excellence in healthcare education. Attend Donate to Educate and help a student achieve their educational goals. All event proceeds benefit Allen College student scholarships, campus enhancements, and lifelong learning initiatives.